Knob and Tube removal Winnipeg | Top Electricians | Winnipeg MB | Powertec Electric Inc.
Knob and Tube wiring was the electrical standard during the late nineteenth century and the first half of the twentieth century. The reason for this was the realtively low cost of wiring a home using knob and tube over running steel jacketed conduit wiring. The concept was very simple. It consisted of four parts. The single insulated copper conducter (the copper wire), secured aong the length of their run on nailed down, insulating porcelain knobs. When the wire had to run through studs or joists, and insulating ceramic tube kept the hot wire away from the wood as well as protected the wire from possible damage if the house shifted. When the wires were pulled into a wall or enter a wiring device such as a lamp or switch the wire was further protected with a loom which is a flexible insulating sleeve. The earliest looms would be an asphalt saturated cotton cloth which was then later replaced with rubber. It can be difficult to determine if you have knob and tube wiring in your home as they can be connected to eaither a fuse panel or circuit breaker. One of the services we offer at Powertec Electric Ltd is to provide homeowners with electrical inspections. This is particularly useful if you are looking to purchase an older home in Winnipeg. As will be discussed further, many insurance companies will not insure a home with knob and tube wiring, forcing you to make expensive repairs. It is better to know this before you make an offer to buy. There are some tell tale signs you have knob and tube wiring in your home. If you have an unfinished basement, look up into your floor joists. 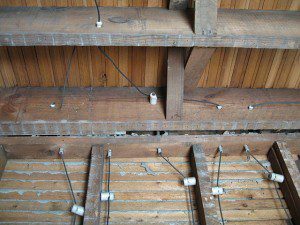 If you see your wire runs supported by ceramic knobs and running through the tubes in your joists. You have knob and tube wiring. You can also go up in your attic and look for the same setup if you have a finished basement. Another way to determine if you have knob and tube wiring is to look inside your switch boxes. Take off the protective outside plate and look inside. If you see a loom wrapped around the wire coming in or if there is no ground wire, you have knob and tube wiring in your home. It is the increase fire risk that has insurance companies cancelling home owner policies. There are a number of reasons why you as a homeowner, should consider having a certified electrician remove your knob and tube wiring from your home. The first and most obvious reason is age. These systems are seventy years old or older. After decades of running electricity through your home, the wires can become very brittle, possibly breaking, interupting power. Another concerned is that the solders that connected the wires together can also start to come loose, interupting power as well. The worse case scenario is an electrical fire starting behind the walls of your home as a result of arcing. Energy efficiency is yet another reason to replace your knob and tube wiring. When current runs through your wires, it generates heat. That heat is disappated into the dead air space between your walls and above your ceiling. That means your walls are most likely uninsulated, costing you hundreds of dollars annually in lost heating and cooling dollars as a result. Modern wiring still generates heat, but it is disapatd through the three wires running through the insulated cable. So by rewiring your home, you can now more effectively insulate your walls and attic. This will not only make your home more energy efficient, but also more comfortable during the year. One thing that really annoys our customers that live in older homes is the lack of outlets. Let’s face it, we have more electrical appliances than was ever imagined seventy years ago. Now we have multiple televisions, computers, tablets, cell phone chargers, pvr players, stereos, cable tv boxes, microwaves, toasters, coffee makers, and so much, much more. Let’s face it, your original knob and tube wiring was not meant to take such a power demand. Also because you have a shortgae of outlets, you find yourself running extension cords and power bars to satisfy the electrical demand of today’s modern living. By having Powertec Electric come in and remove your knob and tube wiring and then rewire your home, we can increase your service as well as install more outlets and switches in you home. This way your home is safer as you are no longer overloading your electrical system and running extension cords all over the place. Finally, the biggest reason to remove knob and tube wiring are Manitoba’s insurance companies. Many are simply refusing to insure homes with knob and tube wiring, as they believe your home poses a higher risk to fire loss. Many times an insurance company will give you a very tight deadline to comply or your insurance will be cancelled. As a homeowner it puts you in a bad position as almost all mortgages require insurance to be placed on the property. So it is better to replace the knob and tube wiring in your home before you need to. If nothing else, when it comes time to sell your home, you will most likely be able to command a higher price as a result of having updated wiring. It also eliminates updated wiring as a condition in the offer to purchase your home. Now that you know what knob and tube wiring is, and why you should have it replaced, call Powertec Electric now at 204-896-3446 to get started. we have done so many knob and tube removal jobs that we are now specialize in this area of electrical work. That means we can get it done, quickly and efficiently, saving you money. We even made it easy and affordable to rewire your home with financing available through Crelogix. With easy affordable monthly payments, plus a higher resale value for your safer and insurable home, there is no reason why you should put off replacing your knob and tube wiring.